I like to think we're living in the golden age of protein. Protein has never been as popular as it is today, and I'm glad people everywhere are finally embracing the power of this mighty macronutrient. Protein is a critical building block that aids in the growth, maintenance, and repair of muscle, and there's no denying its impact on strength, performance, and body composition. As a nutritionist, I find it interesting that so many myths about protein have come and gone, including the claim that the Recommended Daily Allowance (RDA) was perfect for all adults, regardless of how much they trained, and that if you ate more protein than the RDA your kidneys and bones could be in danger. Obviously a lot has changed. In recent years it has become clear that people who exercise regularly need more protein than the RDA, and that higher intakes are quite safe. However, with so many protein supplements on the market, one of the most common questions I get asked is which one to buy. Below are some guidelines to help you pick the right protein type and product for your personal fitness goals! Concentrates: The concentration and processing of protein in powder form can yield different compositions, based on the degree of removal of "non-protein" parts. For example, protein concentrates contain about 70-80 percent protein, with the remaining percent from carbohydrates, minerals, moisture (water) and fats. Isolates: Protein isolates, on the other hand, have had more of the non-protein parts removed and contain up to 90 percent protein with a lesser degree of the non-protein nutrients. For instance whey protein isolate is about 86 percent protein (90 percent dry weight). Hydrolysates: The term hydrolyzed protein, or hydrolysates, refers to the presence of partially digested proteins including polypeptides and peptides. "Partially digested" may sound undesirable, but it may actually be beneficial! In addition to providing amino acid building blocks, peptides might have additional actions in the body. Whey is approximately 20 percent of the protein in cow's milk and has the highest branched-chain amino acid (BCAA) content, including roughly 11 percent leucine and 9 percent combined isoleucine and valine, yielding a 2:1:1 relationship. Leucine is a very desirable amino acid since it plays a direct role in optimizing muscle-protein manufacturing after strenuous training and in response to a protein meal by increasing the activation of the mTOR pathway. Moreover, whey is probably the most thermogenic protein, meaning that the increase in calories burned per calorie consumed is greater than other proteins. This is likely tied to a more acutely potent effect on muscle protein synthesis. 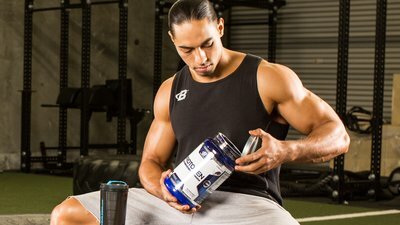 Although it has a lower anabolic, or direct muscle-building effect, when compared to whey, casein is a good source of BCAAs as well as glutamine, which helps it reduce muscle-protein breakdown. Remember net gains in muscle protein reflect the imbalance between muscle protein synthesis (anabolic) and breakdown (catabolic). Thus glutamine lends support more on the anticatabolic side. Because of its slow-digesting properties, casein is often recommended before bed or in between meals, either by itself or in blends with other proteins. We know milk is great for dunking chocolate chip cookies into, but did you also know it's great for speeding up recovery after an intense workout? Milk protein contains all of the essential amino acids in a natural 80/20 ratio of casein-to-whey blend, which allows for the fast and sustained release of amino acids necessary for muscle growth. Milk protein isolates and concentrates are common in protein-powder blends, creamy protein RTDs (ready-to-drink), and protein bars. Eggs are making a serious comeback now that some of the long-held beliefs about their role in heart disease are being dismissed. The egg protein found in protein powders is mostly egg-white protein isolate, and is an egg-cellent alternative for people with milk allergies! Egg protein is also at the top of its class when it comes to quality. With a score of 100 on the biological value (BV) index, egg protein contains all the essential amino acids necessary for protein synthesis, and is easily digested by the body. Perhaps not as well-known as its protein counterparts, pea protein is a great option for vegetarians and those with allergies to dairy and eggs. Not only is it hypoallergenic, it's high in BCAAs and boasts a 98 percent digestion rate—meaning the body is able to use and process the majority of amino acids per serving. This makes pea protein far superior to other plant-based protein powders, which can be difficult to digest and are not well-utilized by the body. Most sport nutritionists agree that athletes and individuals who train hard in the gym need to make protein a major nutritional consideration and target it throughout the day. A good rule of thumb is to set a target at or around 20-30 percent of total calories, or 1 gram per pound of lean body weight—or your lean body weight target—with personalization based on calorie level and meal frequency. For example, a lean 190-pound athlete eating 3,000 calories would target roughly 190 grams of protein per day, which approximates 25% of caloric target. "Most sport nutritionists agree that athletes and individuals who train hard in the gym need to make protein a major nutritional consideration and target it throughout the day." Unless you've been living under a rock for the past few months, you've probably heard of protein spiking and nitrogen spiking in the news. Some brands have been tagged as using additional amino acids like taurine and glycine and even creatine to increase the protein count in a product. They're able to get away with this because all those additional nutrients contain nitrogen, which is the factor used by laboratories to estimate how much protein there is in a product. The problem is that, while those ingredients have their own benefits, they are not protein, nor will they have the same impact on muscle growth or performance benefits as intact protein. So how do you know if the protein you're taking is high quality and contains the right amount of protein? Look for leucine-content call-outs for on the protein powder's label. Leucine, an essential branched-chain amino acid critical for muscle-protein production, appears to help maximize the mechanisms that "trigger" or stoke muscle-protein synthesis, resulting in strength, power, endurance, and size development. Look for at least 2 grams of leucine per serving (scoop). For a whey protein powder the math is easy, a 25 gram protein claim would yield around 2.5 grams of leucine since whey protein is roughly 11 percent leucine. Keep in mind that casein and soy contain less leucine, about 8 percent. Overnight, muscle protein breakdown (MPB) is increased, and losses can be as much as 5-15 grams depending on body size and diet throughout the day and leading up to bedtime. Protein and some carbohydrates first thing in the morning help reverse this negative impact on muscle protein and stimulate MPS. Shoot for at least 20-35 grams of protein at breakfast, again depending on body size, protein type, and total protein targets for the day. A strenuous training session can elevate both MPS and MPB. Your goal is to maximize the former and minimize the latter with both protein and some carbohydrates, either immediately before or after training. Like breakfast, aim for around 20-35 grams of protein. During the night in an unfed state, muscle-protein balance slides more toward MPB than MPS to generate free amino acids to help fuel the body. Consuming at least 20 grams of casein or whey and casein blend, or a lesser amount protein combined with supplemental BCAAs or more specifically leucine, will help keep MPS higher as you sleep.